Thanks to Random House Publishing, the journey of 100Things will be turned into a book in time for Christmas 2011. Writing starts in December 2010 with a book tour and release date scheduled for late 2011. I’m over the moon and can’t wait to fully tick this item off as soon as the first copy is placed on book shelf! If you’re keen to get your hands on a copy, leave your details in the comments box at the bottom of the page. A few years ago I wrote a series of kids books which I planned on getting published. You see it had always been a dream of mine to write a book and one that appealed to kids seemed like a great idea. I even had one book printed and illustrated by a friend. Sadly, not being the best at backing things up on from my laptop, late last year I lost all all 3 stories when I left my laptop in the back of a New York cab. As the cab drove off down 5th Avenue, so to did my chance of ticking off item Number 100- Publish a Book, or so I thought. A few weeks ago I was contacted by Random House Publishing, the worlds biggest book publisher. Thinking that somehow they had not only retrieved my laptop but also miraculously read all 3 kids stories and were so impressed that they wanted to publish them, I was invited into their Sydney offices for a meeting. As it happened, I was wrong. My laptop was still lost and Random House didn’t even know that I had written a series of kids books! Instead, they wanted me to write another book. They wanted me to write about 100Things! It is with a huge smile on my face that I can announce that as of today I have a book deal. 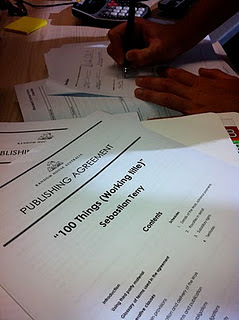 Number 100- Publish a Book is well on the way. Sixteen months after leaving Australia to start a journey that made sense to no-one but myself, I will now be writing a book about the story thus far. A story about a way of thinking, a list and an adventure that I never could have expected. Fittingly, I can’t start writing the book until next week as I am flying to Melbourne on Sunday to attempt to tick off another item from the list (Number 72- Stay Awake for 72 Hours), but when I get back it’s time to start typing! This journey has grown in momentum over the past year and a half and without the support from people, both friends and strangers, around the world there would not be much to write about. For this reason, if you think that there is something that simply must be included in the book, please let me know. I still would love to write a kids book one day!